Here is one of the disc designs from 2007. It was inspired by Kohei Minato's bicycle wheel magnet motor. The stator magnets have their geomagnetic north poles oriented towards the outer edge at 45° angle. 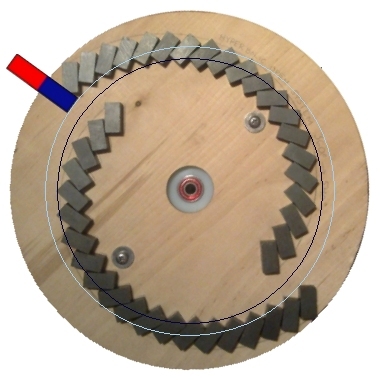 In the picture two rotor magnets are drawn. The rotor magnets are 50 x 50 x 19 mm ferrite magnets and they are positioned about 20 mm above the stator magnets. Below is an excel graph made from digital scale measurements. The vertical line shows the exact position as seen in the first picture. The lines at the horizontal axel are the measurement points, where one step to the right represent 5° clockwise rotation. 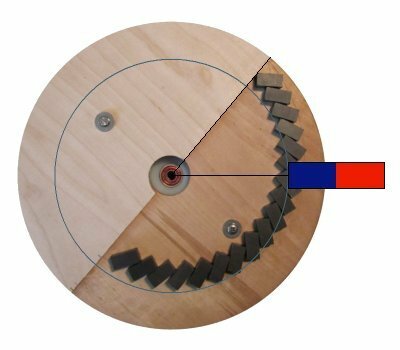 The red coloured areas represent clockwise torque and the blue areas represent counterclockwise torque. Plywood disc was connected to nylon rotor with non magnetic materials. On the disc two hyperbolic spirals were drawn, and 40 ferrite magnets (24 x 12 x 10 mm, BR = 0.4 T, HC = 2 kOe) were glued on the spiral lines at 45° angles with their geomagnetic north poles up. Below is a graph showing two torque waves during one full rotation with one alnico stator magnet (60 x 15 x 10 mm) positioned 10 mm above the rotor magnets. The torque from the smaller radius stator magnet position is shown with deep blue and from the larger radius position with light blue. The vertical line shows the stator magnet position as drawn on the picture. On the horizontal line, one step to the left equals 10° CW (clockwise) rotation. The positive values represent CW torque and the negative values CCW torque. As seen in the graph, the peak CW torque wave becomes about two times stronger and 20 degrees of an arc shorter with larger radius stator magnet position. The total CW torque in relation to CCW torque becomes a little stronger. The setups measured 5% and 7% more CW torque. However, the measurement error can be up to 10%. In the summer 2011 I made a couple of attraction curves. 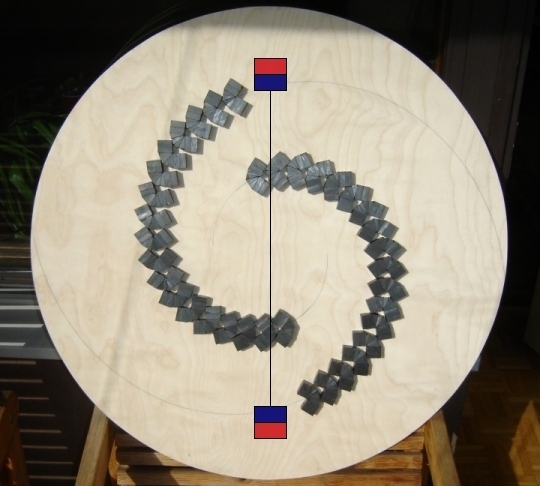 On 'Schauberger's hyperbolic open system' curve 18 ferrite magnets (24 x 12 x 10 mm) were glued at 45° angles. All of the rotor magnets have their geomagnetic south poles upwards. The stator magnet (90 x 24 x 24 mm) is made of many little ferrite magnets. The gap between the stator and the rotor magnets is 10 mm. On the torque curve, the positive values represent CCW torque and the negative values CW torque. The magnet in the above picture is drawn to the balance point (16) were the rotor stops. The point of the strongest torque (11) is at the outer perimeter of the magnet track. The total CCW torque in relation to CW torque is 0.97 to 1.00 which is in the limits of measurement error.